The Mannington’s Pearmain apple was first grown about 1770 from cider pomace thrown under a hedge in the garden of Uckfield blacksmith, Mr Turley. His grandson, John Mannington, local butcher and keen fruitman, sent it to the London Horticultural Society in 1847. Hogg stated, “Mr Mannington was a man of singular intelligence on many subjects and was an enthusiastic pomologist” (Hogg 1851). The variety was well thought of by the Victorians. It is currently cultivated as part of Brighton Permaculture Trust’s National Collection in Stanmer Park, Brighton. You can see a Mannington’s Pearmain apple tree (planted 2011) in Home Farm Orchard, Stanmer Park ( map). 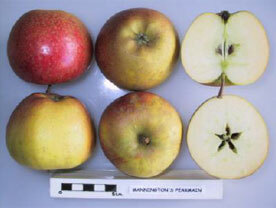 The Mannington’s Pearmain apple has a rich, slightly aromatic taste with a nutty quality. It is medium in size and conic to rectangular in shape with a fleshy protuberance at stalk. The skin is yellow flushed brownish red. In 1847 the London Horticultural Society pronounced it to be a dessert fruit of the highest excellence. The fruit ripens in mid-October and can be stored through until February.